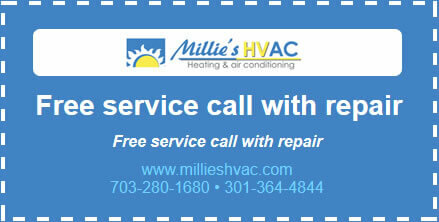 Millie’s Heating and Air Conditioning has been providing Northern Virginia with superior heating and cooling service since 1985. Currently under the management of Andy Popovici, we’re a family–owned business that specializes in residential and light–commercial HVAC repair and installation. We endeavor to provide the best customer service and the highest level of professional expertise for any job we accept. We’ll give you an honest evaluation of your equipment. We know your time is valuable, so we’ll be on time and get the job done right the first time. We’ll make sure that you’re satisfied with the service you receive from Millie’s Heating and Air Conditioning—guaranteed. Our technicians are NATE–certified and factory trained. We only hire highly skilled technicians with a minimum of 10 years experience. We hold weekly training sessions in–house and have them attend manufacturer trainings monthly. Our technicians are and drug tested and background screened, so you can be confident of the skills and character of the person coming to your home.